With a climate change denier in the White House, climate denialism has reached a new low point in America. Indeed, my co-author Tom Toles and I have devoted a whole new chapter to the matter ("Return to the Madhouse: Climate Change Denial in the Age of Trump") in the new paperback edition of our book The Madhouse Effect (now available for pre-order). But any chapter on the topic will inevitably become out of date quickly. Indeed, we have our latest episode in the saga. 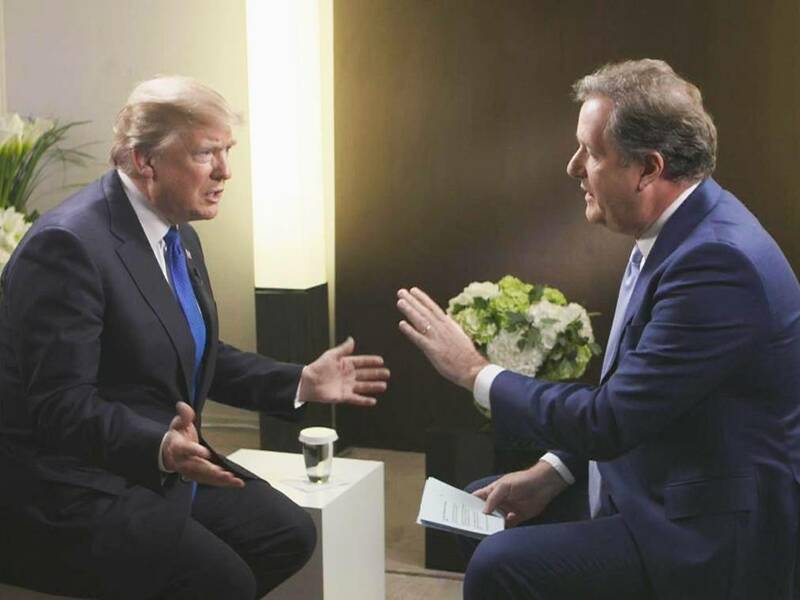 In a new interview with Piers Morgan, Donald Trump continues to deny the basic facts about climate change. As is often the case with Trump, the Costanza principle seems to apply: If Trump makes a claim, then the opposite almost certainly.must be true. 2. Trump was also quoted as saying that "The ice caps were going to melt, they were going to be gone by now, but now they're setting records". In referring to the “ice caps” Trump fails to distinguish between sea ice (which floats on water and which does not contribute to sea level rise when it melts) and the continental ice sheets i.e. the Greenland and Antarctic Ice Sheets (which store huge amounts of ice and once they begin to melt are difficult to stop). The distinction is important when it comes to larger climate change impacts, but for our purposes it doesn't matter, because by either definition of "ice cap", Trump couldn't be more wrong with regard to the predictions. Ironically though he does get one thing right: The "ice caps" are setting records--records for rate of ice loss. "southern hemisphere sea ice is on the increase". There is some truth to that--a small increase was seen for a number of years, though in the southern ocean sea ice extent has far more to do with changing circumpolar wind patterns than temperatures. But that increase is very small, and it is overwhelmed by the dramatic loss in Arctic sea ice. Globally, we are in fact seeing record sea ice....lows. We see that the opposite of what Trump said is in fact true. OK, but what about the ice sheets? Arguably, from the standpoint of climate change impacts, the melting of the ice sheets is far more significant his is ice that is on land, rather than floating on the ocean, it contributes to sea level rise when it melts. Here too the best evidence is that the ice sheets that are vulnerable to melting--the Greenland and west Antarctic Ice Sheets--are losing ice, and far sooner than the models predicted. Indeed, the latest research, in particular a 2016 study in Nature co-authored by Rob Deconto of the University of Massachusetts and my Penn State colleague David Pollard, identified processes that had not been include in previous climate modeling assessments that favor accelerated collapse of the west Antarctic ice sheet. That finding has led scientists to double the projections of global sea level rise by the end of the century from roughly a meter i.e. roughly 3 feet (as indicated in the last IPCC report) to about two meters i.e. roughly 6 feet. Once again, the opposite of what Trump claimed is actually true. Now, we all know that Donald Trump really only appears to care about himself, so perhaps what Trump really means is that climate change simply isn't a problem...for Donald Trump. Well, even here, he is sadly misguided. In an article my co-authors and I published in the Proceedings of the National Academy of Sciences (PNAS) last year, we showed that the latest projected increases in sea level rise, combine with more intense hurricanes, combine for greatly increased flood risk where things hit home for Trump--New York City. We even produced a map of maximum projected flood extent that Trump might want to check out---Trump Tower itself is eventually within the danger zone. By now, most of us have also heard about the special approval that Trump got to build a sea wall to defend his golf course in Ireland from the mounting threat posed by global sea level rise (yes hypocrisy thy name is trump). And Trump's "winter White House" Mar-a-Lago? Yeah, that's probably toast too, if we don't act on climate change. When it comes to climate change policy in the current administration, our best hope is perhaps that Trump comes to realize that climate change is a threat not just to human civilization but to the one thing he cares about--Trump. But don't count on it.